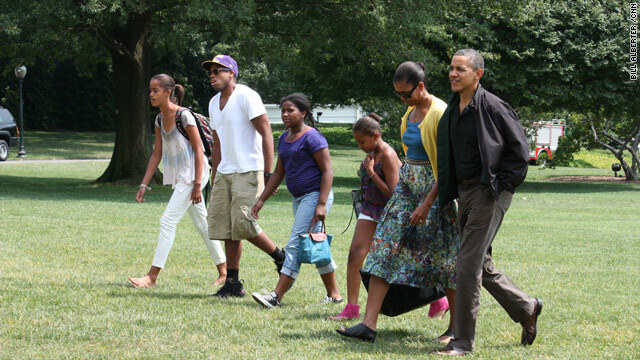 Obama family and friends return to the White House on Sunday Aug 7, from Camp David. President Obama is laying low at the White House today. No doubt he and his staff are keeping on eye on the world markets for any aftermath of the S&P down grade of America's debt. Monday should also bring a nice game of "Who's to blame" for the down grade. "This is essentially a tea party downgrade," Obama's top political advisor David Axelrod told the CBS program Face the Nation. "The tea party brought us to the brink of a default." Sen. Lindsey Graham, R-S.C., also appearing onFace the Nation, "The Tea Party didn't destroy Washington," Graham said. "Washington was destroyed before the Tea Party got there." Enjoy your tax payer paid vacation much? You drove the country off a cliff then went for a swim. What a loser, more a community organizer than a real president. Because everything wrong with this country is totally his fault. First off, you're going to attack him for going to Camp David? Really? I could say so much about this but I will leave it at this: "Look at Google." Google knows better than anyone that happy workers are more productive, efficient workers. Second, "you drove the country off a cliff," come on. Obama tried to work out an optimal debt reduction plan, but the Tea Party and GOP in general was way too stubborn to compromise. Blame this highly polarized political atmosphere for things being the way they are. Both sides contributed, don't just single out one man. The economy was over and off the cliff when he took office. Remember September 29, 2008.
Who's the gangsta in the photo above? No one is, so who are you talking about? R-L. President Obama, Michelle Obama, Roxanne Nesbitt, Sasha Obama, nephew Avery Robinson, and Malia Obama. Stop telling us every day what needs to be done, just do it, we know what needs to be done. You applied for the job and we hired you and so far you've failed. We will not renew your contract in 2012. Gov. Perry...that is laughable...the last thing we need is another Texas governor.....twice was two times too many. That's the truth, Jean! LOL! Wasn't Jimmy Carter from Georgia? Yes, President Jimmy Carter is from Georgia; Plains, Ga. He was also governor of Georgia. Why? So JEAN since when did all of the relatives live at the white house??? and YES they look Gangster.....i would think they would have enough sense to dress appropriately when they are representing the whole USA to the world. Now we really look like the family from the block. Sorry, but the American dream is now gone. It is a wonder he doesn't have his pants down to his ankles. Bottom line it is what it is...and it is a DISGRACE!! !